For the uninitiated, a lassi is a delicious yogurt-based chilled drink hailing from the Punjab region of India. Lassis come two ways, sweet or salty, and are popular throughout India and Pakistan. Lucky for us, lassis are beginning to take hold here in the United States! Why the luck? Because lassis are so delicious!! 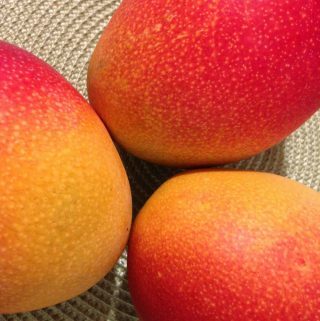 Sweet lassis are made with and without fruit, and in the “with fruit” category, mango lassis are the most popular. Makes sense to me! There is no ONE WAY to make a mango lassi, so experiment! Below are some suggested core mango lassi recipes to start with. Remember that Greek yogurt is strained and will produce a thicker mango lassi; regular plain yogurt will make for a thinner lassi. You’ll need less ice to produce a quintessentially cool, refreshing mango lassi if you begin with mangoes or mango pulp that have been refrigerated. This is my preference because I tend to prefer more robust flavors (less ice). And experimenting with different textured sweeteners like honey, stevia, demerara sugar, or turbinadosugar is really the only way to see what you like best. When you find the combination that suits you best, serve it up for any spring or summer gathering. As for aesthetics, I would serve my guests mango lassis in footed glasses garnished with mint leaves or saffron strands. Mango slices placed on the sides of the glasses might be nice too. I tend to prefer organic looking serving pieces, but you might prefer a more traditional porcelain tray. Whatever you choose, the light-orange-colored lassis will be beautiful! In all the below recipes, place the ingredients in a blender and blend until frothy and smooth. Serve and enjoy immediately! 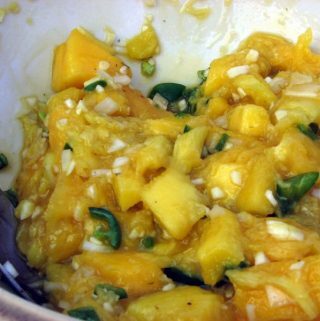 Mango pieces should come from ripe, skinned mangoes. If you can’t get ripe mangoes, try mango pulp! If you can’t find mango pulp at your local grocer, try Amazon or India Blend, both of whom will deliver all the mango pulp you could ever need right to your doorstep. And lastly, if you are interested in mango lassis, you might be interested in other types of Indian cuisine. India Blend has a great selection of hard-to-find ingredients delivered to your doorstep! Previous Post: « Chocolate Dipped Mango Orchids. Need I Say More?